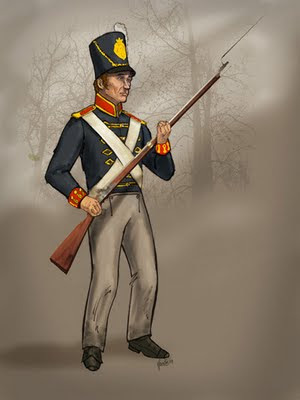 Here's an illustration of a British Gunnary Sgt. during the Napoleonic Wars I finished yesterday for historical documentary of a family history... hopefully slated for PBS. It turned out pretty decent, I was limited on time so I didn't get much of a chance to do much with the ground and stuff. I might go back and add some texture soon. Expect to see more illustration! - Todd McGowan is editing Southside of Elsewhere. - Salt of the Earth is 99% complete, is very close to being scored. - Have been in a deep development mode for an upcoming project. I've got a couple of these blogs, mostly for my filmmaking endeavors... but this one will be soley dedicated to my artwork... drawings, sculpture, model building, etc etc etc etc, as well as my thoughts on drawing, books I've come across and artists that I admire. Logline: Where would you go if all that you were... was erased? A researcher and his family become fugitives when his former employer becomes interested in his young daughter's intellectual abilities. 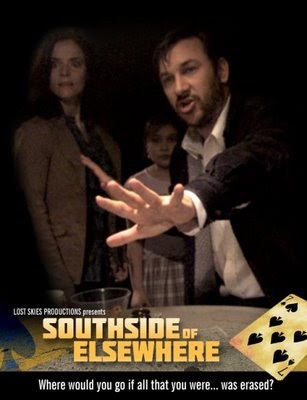 Southside of Elsewhere is the second of a trilogy of short films that are precursors to a future-noir feature that is in pre-production. Pre-production began back in November '08. I met with Bob Lanoue and Katherine Taylor of Friendly Universe Productions, and Antonio Lexerot of Lexerot Entertainment. I had asked Katherine and Antonio of they would play the leads, Callie and Sam Merrill, a divorced couple with joint custody of their daughter, Vivian. Reshoots? Nah… we had several discussions and even planned on reshooting our first scene- but ultimately schedules and money has prevented us from doing so. The original scene stands very well and we are planning on using ADR which we had recorded on location instead of entire reshoot. Composer? We have signed on Gunnar Spardel as the composer to Salt of the Earth. Gunnar’s work is awe-inspiring, you can hear his work here: http://gunnarspardel.com/. VFX? After speaking to a few VFX artists, we are still looking for someone to help with some effects. The first shot is a full shot of a satellite in orbit, the rest involves composite work (including heat distortion effects). There are opportunities for matte and title work. It's been a little bit, hasn't it? We'll, we've been extremely busy. I'm still trying to compile a load of stuff and process it into some sort of managable chunks. - Lost Skies Productions is currently looking for a sound designer, VFX artist and a composer to help bring Salt of the Earth to completion. Interested parties, please contact the director Juan Maestas at jmaestas@lostskies.com! 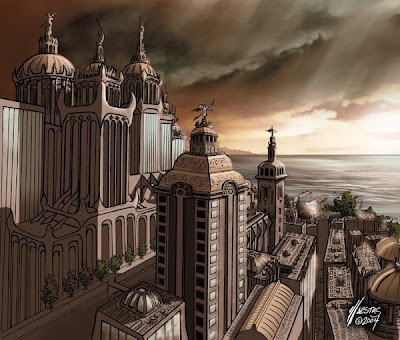 - Salt of the Earth is on IndieGoGo! Please, please, PLEASE help us promote it- go to the IndieGoGo site and get the code for the widget below, and post it to your site or blog! Spread the word! - We've also posted a project on MyProducer.tv! MyProducer.tv is a new social networking site for filmmakers, and it's currently in beta. Happy New Year from Lost Skies! Click for a larger poster. The majority of the photos are from Benjamin Bamba which include behind the scenes and premiere for the 48 Hour Film Project "Maybe...", behind the scenes from "Salt of the Earth" and our involvement in Ritual Picture's "Oisin". I personally want to say thank you to everyone who had participated in all the projects we were involved in... we made a lot of new friends and created some memories I will carry for the rest of my life. Thanks everybody. I'm not kidding when I say we're just getting started. We have plans for the second and third 'future noir' shorts and we are considering on participating in this year's 48 Hour Film Project! As for 2009, this year will be faster and more intense. You can count on that.